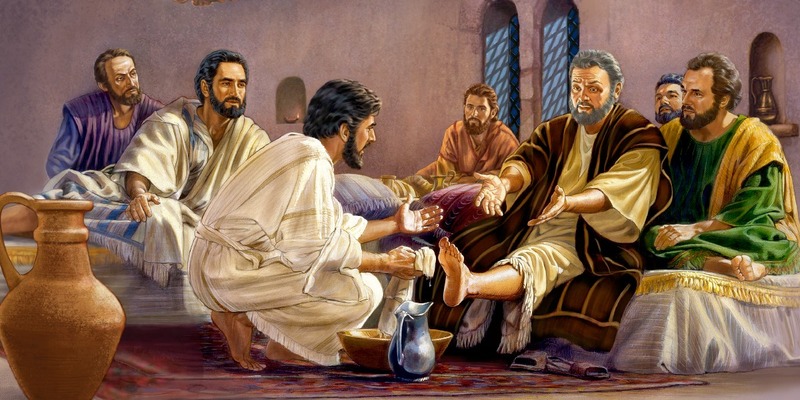 Humility | ADULT CATECHESIS & CHRISTIAN RELIGIOUS LITERACY IN THE ROMAN CATHOLIC TRADITION: hosting ONLY True Christians!! !, or "How to think Catholic!!" Presence of God – O my God, help me to know You and to know myself! I know that You are He Who is, and I am he who is not! Among all the creatures in which we take pleasure and toward which our nature seems to be attracted the most, self undoubtedly holds the first place. There is no one, no matter how limited in talents and good qualities, who does not love his own excellence, and who does not try, in one way or another, to make it shine forth to himself and to others. It is for this reason that we often spontaneously exaggerate our own worth, and, as a result, are demanding and pretentious. This makes us haughty and arrogant, as well as difficult in our relations with others. Humility is the virtue which keeps within just limits the love of one’s own excellence. Whereas self-esteem often induces us to make ourselves too evident, or to occupy a place which is higher than our due, humility keeps us in our own place. Humility is truth: it tends to establish in truth both our intellect—by making us know ourselves as we really are—and our life, by inclining us to take, in relation to God and to men, our proper place and no other. Humility makes us realize that, in the sight of God, we are only His little creature, entirely dependent upon Him for our existence and for all our works. Having received life from God, we cannot subsist even one moment independently of Him. He Who gave us existence by His creative action, maintains life in us by His conserving action. In addition we cannot perform the slightest act without God’s cooperation, in the same way that a machine—even a perfect one—cannot make any motion until it is started by the one who made it. It is very true that, unlike the machine, our acts are neither mechanical nor compulsory, but are conscious and free; yet, we cannot move even a finger without the concurrence of the divine Artist. It follows then that everything we possess in the order of being—qualities, gifts, capacities—and everything we have accomplished in the order of action, is not ours, but all, in one way or another, are gifts of God, all are acts performed with God’s help. “What hast thou that thou hast not received? And if thou hast received it, why dost thou glory, as if thou hadst not received it?” (1 Corinthians 4:7). “O omnipotent Father, God of truth, God of love, permit me to enter into the cell of self-knowledge. I admit that of myself I am nothing, but that all the being and goodness in me comes solely from You. Show me my faults, that I may detest my malice, and thus I shall flee from self-love and find myself clothed again in the nuptial robe of divine charity, which I must have in order to be admitted to the nuptials of life eternal” (St. Catherine of Siena). “Give me, O my God, a thorough knowledge of myself! Let me be really convinced that I am nothing and that You are everything! Do not let me think that I am anything more than the nothing I am. Let me do nothing more for myself, but all for You! Grant that no creature may think any more about me, do anything more for me, give me anything more, but let all be done for You and given to You. And may my nothingness be reduced to nothing in the eyes of all creatures and in Yours, my God, that You, the All, may be all, in all and through all.” (St. John Eudes). Reveal my nothingness to me, O Lord, reveal it so well that, not only shall I understand it, but I shall also have a practical, profound conviction of it. You know how painful that is to my proud nature! My intellect cannot resist the evidence of truth and is obliged to admit that I am nothing, have nothing, and can do nothing without You, yet my ego is always trying to attribute something to itself, to take the credit for this or that and to take as much pleasure in it as if it were its own. Help me, O Lord, to triumph over this pride which, as You see, steals Your gifts and makes my life sterile by preventing me from receiving the abundance of Your graces. That God would take on the form of His creature to redeem said, demonstrates, profoundly, the value of the virtue of humility and the priority, and God’s desire that we should emulate Him. Do so, even as I try. Presence of God – Out of the depths of my misery I have cried to Thee, O Lord; Lord, hear my voice…. I trust in Thee. Christian humility does not lower, it elevates; it does not cast down, but gives courage, for the more it reveals to the soul its nothingness and abjection, the more it moves it toward God with confidence and abandonment. The very fact that in everything—in essence as in act, in the natural as in the supernatural order—we depend on Him, and that we can do nothing without Him, shows us that God wants to sustain us continually by His help and His grace. Consequently, the relations of a humble soul with God will be those of a child who confidently expects everything from its father. This is the lesson that Jesus wished to give His Apostles when they asked Him who would be the greatest in the kingdom of heaven: “Amen, I say to you, unless you be converted and become as little children, you shall not enter into the kingdom of heaven. Whosoever therefore shall humble himself as this little child, he is the greater in the kingdom of heaven” (Matthew 18:3,4). “To remain little,” explains St. Thérèse of the Child Jesus, “is to acknowledge one’s nothingness and to expect everything from the good God, as the child expects everything from its father…. Even among the poor, a child, while he is very little, is given everything that is necessary, but when he has grown, his father no longer wants to support him, and says ‘Go to work now! You can rely on yourself.’ It is that I might never hear those words that I never wanted to grow up, because I felt incapable of earning my own living: eternal life” (Novissima Verba). To the soul who humbly acknowledges its poverty and turns toward God with complete confidence, He is a very tender Father who delights in showering His gifts upon it and in doing for it what it cannot accomplish by itself. Then the smallest soul—that is, the one most thoroughly convinced of its own nothingness—becomes the greatest, since it has the greatness of God Himself at its command. “I admit, O Lord, that I am very weak; I have salutary proof of it every day. But You deign to teach me the knowledge which makes me glory in my infirmities. This is a very great grace, and only in it do I find peace and contentment of heart, for now I understand Your ways: You give as God, but You want humility of heart” (Thérèse of the Child Jesus, Letters). G[ood] Lord, Your light penetrates my soul and makes me understand how far from Your ways are mine! Instead of being disturbed on account of my miseries and discouraged by my falls and failures, instead of pretending to succeed in everything and to accomplish great things, I must humbly accept the fact that I am weak, needy, and absolutely unable to get along without Your help. How sweet it is, O my God, for a soul who loves You, to need You so much that it can do nothing without You! It is sweet for me, for in this way I learn that You wish constantly to take part in my poor life, that You want to sustain me always by Your grace, and that You will never of Yourself abandon me. To give me the fullness of Your divine help, You are only waiting for me to come before You with the humble, trusting attitude of a child who, not being able to rely on his own strength and resources, expects everything from his father. You wish me to be thoroughly convinced of my nothingness and to accept with love the fact that I am nothing so that You may be my All. Deprive me, O Lord, of every remnant of confidence in myself. Every man is like the grass of the field which springs up today and tomorrow is not, and what greater foolishness is there than to rely on the strength of a blade of grass! Free me, O Lord, from such stupidity and place me, I beg of You, in the way of truth. O You who are Truth, sanctify me in the Truth, in the truth of my nothingness. “Nothing troubles us so much as self-love and self-regard. Should our hearts not grow soft with the sentiment we desire when we pray and with the interior sweetness we expect when we meditate, we are sorrowful; should we find some difficulty in doing good deeds, should some obstacle oppose our plans, we are in a dither to overcome it, and we labor anxiously. Why is this? Doubtless, because we love our consolations, ease, and comfort. We want to pray as though we were bathing in comfort and to be virtuous as though we were eating dessert, all the while failing to look upon our sweet Jesus, Who, prostrate on the ground, sweat blood and water from the distress of the extreme interior combat He underwent (Mark 14:35; Luke 22:44). Self-love is one of the sources of our anxiety; the other is our high regard for ourselves. Why are we troubled to find that we have committed a sin or even an imperfection? Because we thought ourselves to be something good, firm, and solid. And therefore, when we have seen the proof to the contrary, and have fallen on our faces in the dirt, we are troubled, offended, and anxious. If we understood ourselves, we would be astonished that we are ever able to remain standing. This is the other source of our anxiety: we want only consolations, and we are surprised to encounter our own misery, nothingness, and folly. – and leave all the rest to God’s care. 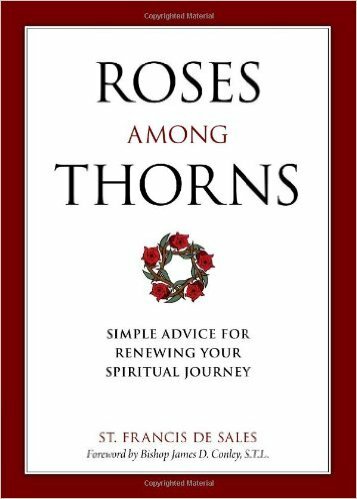 Why should we torment ourselves if God is our aim and we have done all that we can? Why be anxious? What is there to fear? God is not so terrible to those who love Him. He contents Himself with little, for He knows how little we have. Our Lord is called the Prince of Peace in the Scriptures (Isaiah 9:6), and because He is the abso­lute master, He holds all things in peace. It is nevertheless true that before bringing peace to a place, He first brings war (cf. Matthew 10:34-36) by dividing the heart and soul from its most dear, familiar, and ordinary affections. Now, when our Lord separates us from these passions, it seems that He burns our hearts alive, and we are embit­tered. The separation is so painful that it is barely possible for us to avoid fighting against it with all our soul. Peace is not lacking in the end when, although burdened by this distress, we keep our will resigned to our Lord, keep it nailed to God’s good pleasure, and fulfill our duties cou­rageously. We may take for example our Lord’s agony in the garden, where, overwhelmed by interior and exterior bitterness, He nonetheless resigned Himself peaceably to His Father’s divine will, saying, “not My will, but Thine be done” (Luke 22:42, Douay-Rheims). And He maintained this peace when admonishing three times the disciples who failed Him (Matthew 26:40-45). At war with sin and suf­fering bitterly, He remained the Prince of Peace. The first is that we often mistakenly think that we have lost our peace when we are bitter. If we continue to deny ourselves and desire that everything should be done in accord with God’s good pleasure, and if we fulfill our duties in spite of our bitterness, then we preserve our peace. The second is that it is when we are suffering interiorly that God rips off the last bits of skin of the old man in order to renew in us the “new man that is made according to God” (cf. Ephesians 4:22-24). And so we should never be disturbed by such sufferings or think that we are disgraced in our Lord’s eyes. The third is that all the thoughts that give us anxious and restless minds are not from God, who is the Prince of Peace; they are, therefore, temptations from the enemy, and we must reject them. We must in all things remain at peace. Should interior or exterior pains afflict us, we must accept them peacefully. Should joys come our way, they must be received peace­fully, without transport. If we must flee evil, we must do so calmly, without being disturbed; otherwise, we may fall in our flight and give the enemy the chance to kill us. If there is good to be done, it must be done peacefully, or we will commit many faults through haste. Even penance must be done peacefully. “See,” says the penitent, “that my great bitterness is in peace” (cf. Isaiah 38:17). As to humility, this virtue sees to it that we are neither troubled by our imperfections, nor in the habit of recalling those of others, for why should we be more perfect than our brothers? Why should we find it strange that others have imperfections since we ourselves have so many? Humil­ity gives us a soft heart for the perfect and the imperfect: for the former out of reverence and for the latter out of compassion. Humility makes us accept pains with meek­ness, knowing that we deserve them, and good things with gratitude, knowing that we do not. Every day we ought to make some act of humility, or speak heartfelt words of humility, words that lower us to the level of a servant, and words that serve others, however modestly, either in our homes or in the world. -by Ford Madox Brown, 1852–6, oil on canvas, 116.8 × 133.3 cm (46 × 52.5 in), with frame: 147.5 × 164 × 9.8 cm (58.1 × 64.6 × 3.9 in), Tate Britain Gallery, Millbrand in London, not on view. Please click on the image for greater detail. Pride was the downfall of Satan/Lucifer and his demons. 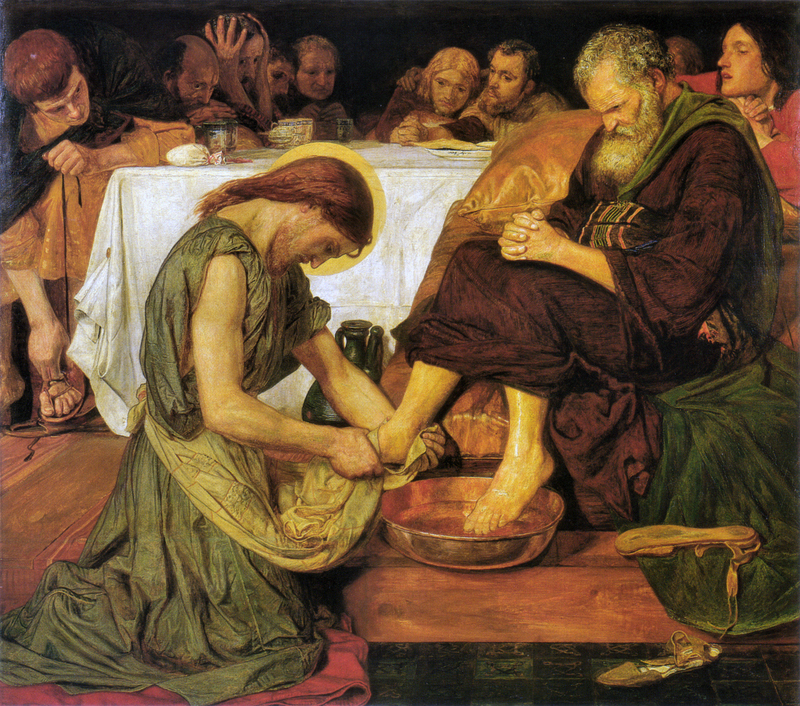 Presence of God – O Jesus, You Who were so humiliated for us, teach me how to practice true humility. Charity is the essence of Christian perfection, for charity alone has the power to unite man to God, his last end. But for us poor, miserable creatures, whom God wishes to raise to union with Himself, is charity the ultimate basis of the spiritual life? No. There is something deeper still which is, so to speak, the basis of charity, and that is humility. Humility is to charity what the foundation is to a building. Digging the foundation is not building the house, yet it is the preliminary, indispensable work, the condition sine qua non. The deeper, and firmer it is, the better the house will be and the greater assurance of stability it will have. Only the fool “built his house upon the sand,” with the inevitable consequence of seeing it crumble away very soon. The wise man, on the contrary, “built … upon a rock” (Matthew 7:24-26); storms and winds might threaten, but his house was unshakable because its foundation was solid. Humility is the firm bedrock upon which every Christian should build the edifice of his spiritual life. “If you wish to lay good foundations,” says St. Teresa of Jesus to her daughters, “each of you must try to be the least of all” that is, you must practice humility. “If you do that … your foundation will be so firmly laid that your Castle will not fall” (cf. Interior Castle [Mansions] for post on humilityVII, 4). Humility forms the foundation of charity by emptying the soul of pride, arrogance, disordered love of self and of one’s own excellence, and by replacing them with the love of God and our neighbor. 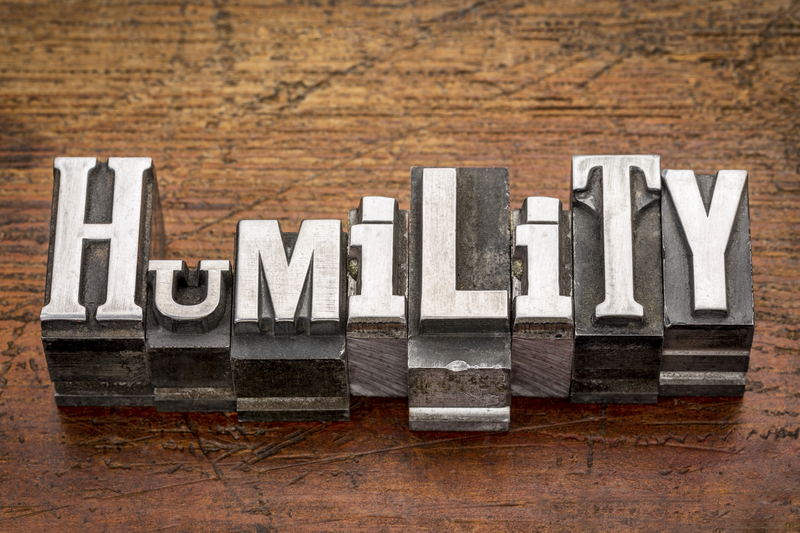 The more humility empties the soul of the vain, proud pretenses of self, the more room there will be for God. “When at last [the spiritual man] comes to be reduced to nothing, which will be the greatest extreme of humility, spiritual union will be wrought between the soul and God” (St. John of the Cross, Ascent of Mt. Carmel, II, 7, 11). “O my God, You make me realize how far I must descend in order that my heart may serve as a dwelling-place for You: I must become so poor that I have no place whereon to lay my head. My heart is not wholly emptied of self, and that is why You order me to descend. Oh! I want to descend much lower so that You will be able to rest Your divine head in my heart and know that there You are loved and understood. O sweet, divine Guest, You know my misery; that is why You come to me in the hope of finding an empty tabernacle, a heart wholly emptied of self. This is all You ask” (cf. St. Thérèse of the Child Jesus, Letters). O Lord, help me to excavate in my poor soul that abyss of humility which will attract the abyss of Your infinite mercies. Help me to descend, although my pride seeks to rise. Help me to recognize and humbly confess my nothingness and my weakness, although my pride desires so much to have me esteemed as something great. Help me to glory in my infirmities, although my pride always tends to glory in what is not mine, but Your free gift. How true it is, O God, that grace follows an entirely different road from that of nature! Give me the strength to travel on this way with courage, to swim against the current, the muddy, treacherous current of my pride. How can I succeed if You; do not come to help me? But I trust in You, Lord, because I know that You are always ready to uphold the weak who have recourse to You with trust; because I know that, if my pride is great, Your mercy is infinite and Your omnipotence is invincible; because I know that if “anyone is an inactive man that wants help, is very weak in ability and full of poverty, Your eye looks upon him for good, and lifts him up from his low estate and exalts his head” (cf. Sirach 11:12, 13).